The Panther–Wotan line was a defensive line partially built by the German Wehrmacht in 1943 on the Eastern Front. The first part of the name refers to the short northern section between Lake Peipus and the Baltic Sea at Narva. It stretched all the way south towards the Black Sea along the Dnieper. Ivan Tikhonovich Grishin was a Soviet Army Colonel general and Hero of the Soviet Union. Grishin enlisted in the Red Army during the Russian Civil War and fought against the Tambov Rebellion. He became an officer and graduated from the Frunze Military Academy in 1936. In October 1940, he became the commander of the 137th Rifle Division, which he led through the World War II battles of Smolensk and Moscow. Grishin became 50th Army chief of staff and in April 1943 transferred to the same position in the 11th Guards Army. 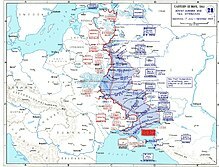 Soon after, he became 49th Army commander and led the army through the Smolensk Operation, Operation Bagration, the East Prussian Offensive and the Berlin Offensive at the end of the war. Postwar, Grishin commanded the 6th Guards Army. In 1946, he became the head of combat training for the Ground Forces. Grishin died in 1951 in Moscow.